For the past 8 years1 I have written hundreds of thousands of words about mostly one company’s hardware and software: Apple. It’s the company whose products I tend to enjoy the most, so it just made sense to talk about them. Over the past few years I’ve seen fit to dive into Android as well, and the results have been pretty great. On the one hand, I got to experience a platform I wouldn’t normally use, and on the other hand, I got to create quite a bit of content that people seem to enjoy. Now I’m off to try a platform that I have never dared explore at length before. That platform is Windows. I have a Microsoft Surface Go (64GB) running Windows 10, I’ve taken it out of S mode to make sure I’m not hamstrung by any unnecessary limits, and I’m in the process of getting my software all set up so I can move most of my work to it. I’ve also picked up a Surface Go Signature Type Cover (in burgundy) which turns this into a regular old iPad Pro equivalent in terms of form factor and inputs. I have not gotten a Surface Pen yet, but it’s likely a matter of time on that piece. 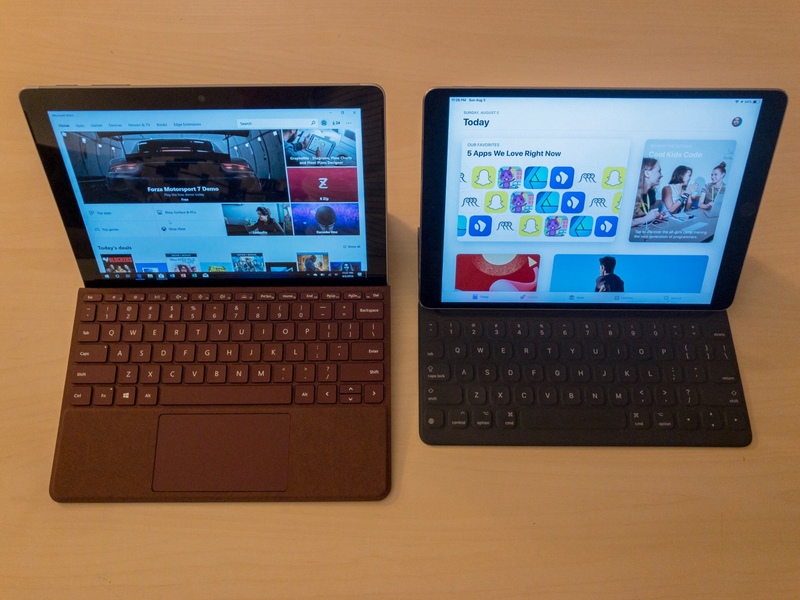 I intend to use the Surface Go as an iPad replacement as much as I can. Some of my work requires iOS (podcast recording, for example) so I won’t move everything over, but I will make a serious effort to do as much as I can on the Surface. Microsoft is pitching this as an iPad competitor, so I want to know if I really do feel more liberated on a Windows tablet than an iOS one. Well, I generally don’t like PC hardware, but Microsoft makes some good stuff. The build of the Surface Go is solid and makes the Apple fan in me happy. Also, Microsoft uses the Surface line to show the rest of the industry what is possible. In a way, it’s a reference device, and that sounds like exactly what I want to use. Just like when I got the Pixel 2 last year, I want to use a device that integrates hardware and software incredibly closely. Does a traditional PC OS on an iPad-like device make sense in 2018? Does Windows allow me to do more “real work” than iOS? Does this make me want a touch screen Mac more or less? How well is Windows built to handle touch as a main, or only input? How is the keyboard compared to the iPad’s Smart Keyboard? I’m sure more will come up as I use the device, but those are what I am focused on up front. I hope you enjoy the ride.